The port town of Ocho Rios used to survive on the strength of fishing and banana boats, but now it is the daily arrival of cruise ships full of tourists that keeps the coffers full all along the northeast coast of Jamaica. Ocho Rios and its near neighbours Runaway Bay, Discovery Bay and Port Antonio are mainly clusters of holiday resorts and hotels, catering to package-deal holidaymakers and several celebrities who maintain their private retreats in the region. 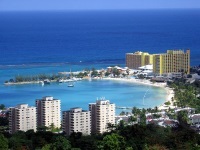 Ocho Rios cannot claim to provide a genuine Jamaican experience, and is filled with tourist paraphernalia. Because of the need to entertain thousands of fun-seekers, the natural and historical attractions of the area have been commercialised and controlled. There is plenty to see and do in-between bathing and sunning yourself on the magnificent beaches, from climbing up waterfalls to horseback riding through sugar cane plantations, or taking afternoon tea at the former home of British playwright/songwriter, Noel Coward. Although carefully tailored to suit tourist needs, the region is still very beautiful and the good amenities are a bonus. The surrounding countryside at Ocho Rios (situated in the 'Garden Parish' of St Ann) is lush and tropical, with fern-clad cliffs and breathtaking waterfalls. A self-drive tour of the region to take in the scenery, like a drive through the famous three-mile vine-draped Fern Gully, is very worthwhile. Ocho Rios is a town dedicated to fun and sun, a crossroads of pleasure and leisure full of surprises and delights in the centre of Jamaica's vacation wonderland.